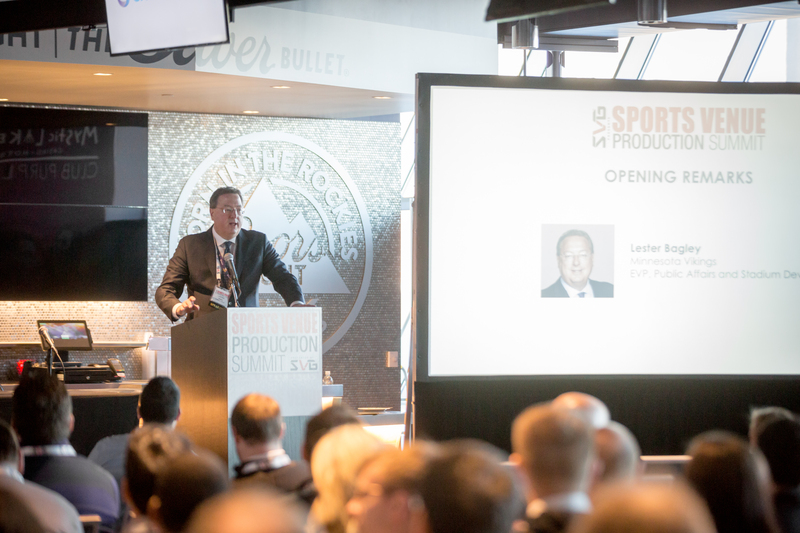 SVG’s annual Sports Venue Production Summit highlights the latest in sports-venue production and technology, and perhaps no stadium better exemplifies the current state of the art than the NFL’s newest, U.S. Bank Stadium. 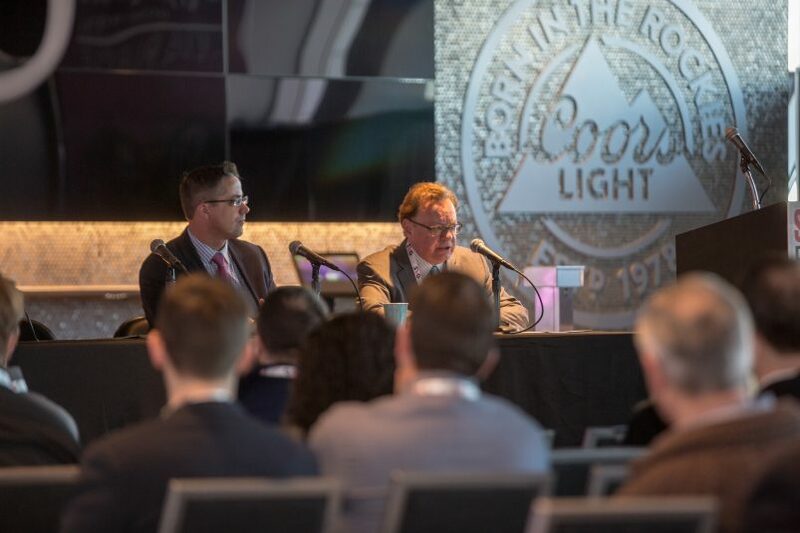 More than 160 attendees turned out for the two-day event this week for a behind-the-scenes tour of the Minnesota Vikings’ new home, an opening-night reception overlooking the field, and a full slate of panel discussions focused on delivery of the best possible game-day experience to fans. “It’s a great building. We’re really proud of it, and it has exceeded expectations,” said Lester Bagley, EVP, public affairs and stadium development, Minnesota Vikings, in his opening remarks to attendees on Day 2. “It has become a community asset after a long hard battle in Minnesota with the public and with the legislature in getting this to the finish line. Alpha Video’s Brian Beckwith, broadcast design engineer, explains the inner workings of the U.S. Bank Stadium video-control room to event attendees. The event kicked off on Monday March 13, with a top-to-bottom tour of U.S. Bank Stadium, where attendees were invited inside the Vikings locker room and interview room and onto the field. 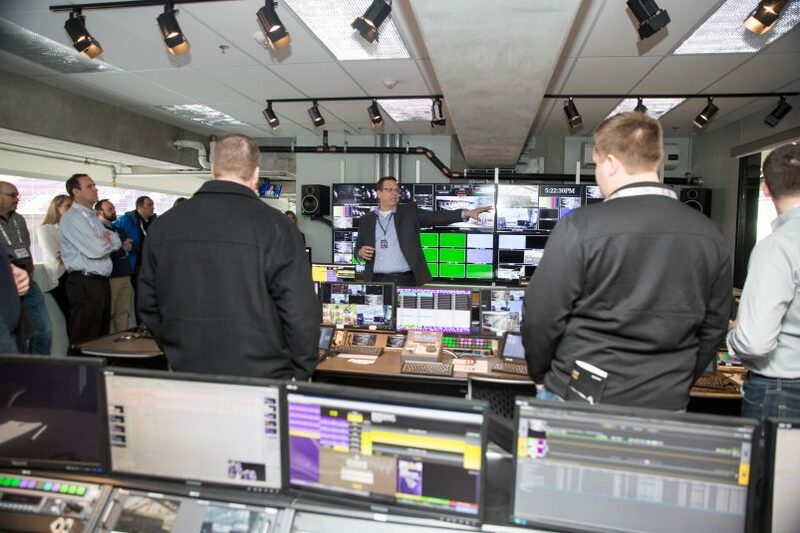 The tour also hit the truck dock (located inside the building to protect mobile units from harsh Minnesota winters) and the video-control room, located on the press level. Van Wagner Sports and Entertainment contracted Eden Prairie, MN-based Alpha Video Sports & Entertainment to integrate the video-control room and work with Daktronics on the LED elements around the stadium, including the venue’s two end-zone displays measuring 68 x 120 ft. and 50 x 88 ft., respectively. Minnesota Vikings’ Lester Bagley opened the event. Alpha Video worked with the Vikings, the Minnesota Sports Facilities Authority (which owns and operates the stadium), and SMG (which manages the stadium) to build out a robust equipment package within the group’s budget. In total, the group dedicated more than $60 million of its total budget to technology. The finished project is a hybrid of IP and baseband technologies that support 4K content capture and 1080p output to the video displays. The control room features both Evertz IPX and baseband routing, an 8M/E Ross Acuity switcher with 4M/E and 2M/E control panels to cut secondary shows, and Ross XPression graphics systems. The all-EVS room houses a wide range of EVS products, including three 12-channel 1080p replay servers, one 4K replay server, IPDirector, Epsio Zoom, and MultiReview. 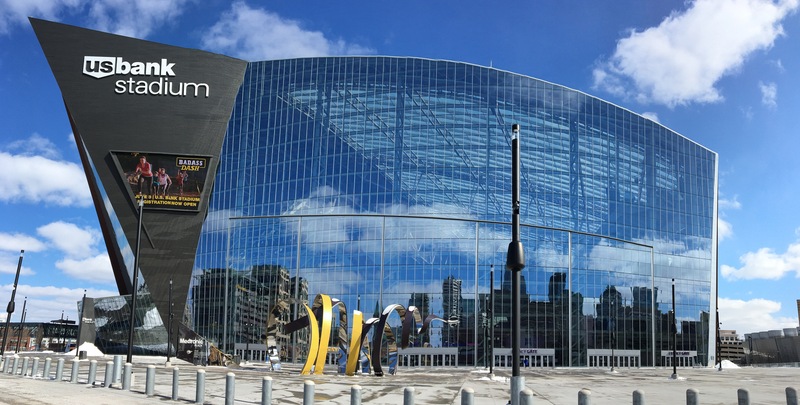 To create the in-venue show, the Vikings added eight Sony HDC-4300 cameras, two handheld cameras, and five Sony PMW-F55 POV cameras. 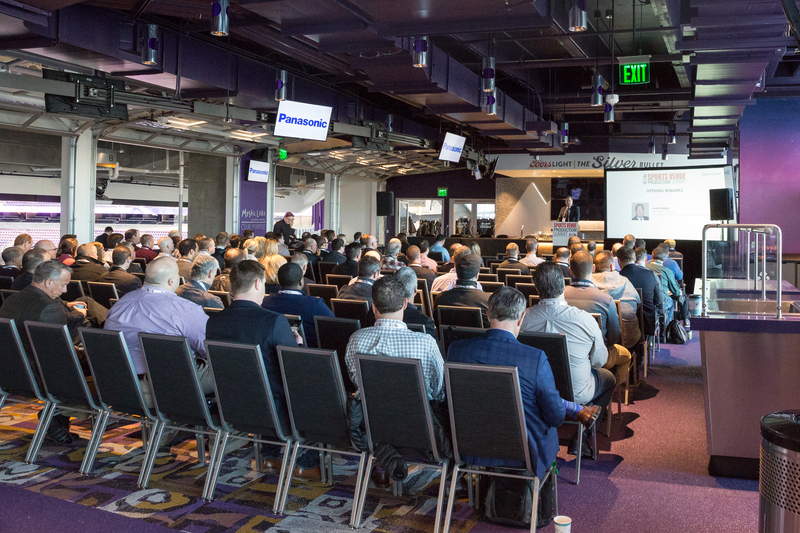 Sports Venue Production Summit Goes Inside U.S. Bank Stadium, Minnesota Vikings’ Commitment to Fan Experience outlined the budget process and capital campaign. In making technology decisions, the team’s priorities were that the gear be reliable, flexible, and extensible. On Day 2 of the Sports Venue Production Summit, Minnesota Sports Facilities Authority Chief Technology Advisor James Farstad and Minnesota Vikings VP, Corporate Technology and Partnerships, John Penhollow took to the stage to explain the inner workings of the budgetary process and the continuing capital campaign to keep U.S. Bank Stadium at the forefront of technology. Throughout Days 1 and 2, a key focus of the Sports Venue Production Summit was U.S. Bank Stadium’s preparations for Super Bowl LII in 2018. The stadium was constructed with 550 miles of fiber and 6,200 miles of copper, which will certainly come in handy for the big game. In the meantime, the focus remains squarely on delivering the best possible experience for Vikings fans. Check this site for more reports, including photos and video, from SVG’s Sports Venue Production Summit next week.